In one of the most hotly anticipated sequels in memory, J.K. Rowling takes up where she left with Harry's second year at the Hogwarts School of Witchcraft and Wizardry. Old friends and new torments abound, including a spirit named Moaning Myrtle who haunts the girl's bathroom, an outrageously conceited professor, Gilderoy Lockheart, and a mysterious force that turns Hogwarts students to stone. Trying to follow up on the huge success of the first Potter book isn't a task that I envy. You not only have to live up to enormous expectations, you also have to prove that you weren't just a one book wonder. Rowlings manages okay. In fact she manages more than okay. 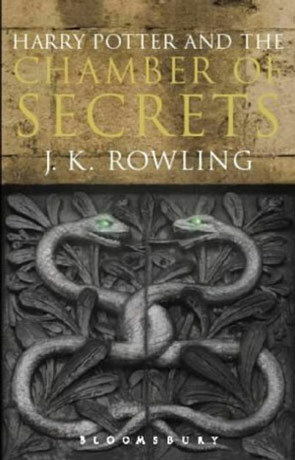 The Chamber of Secrets, has everything one could expect and lacks exactly what one could expect, namely the novelty of The Philosopher's Stone. Leaning heavily on the things we learn in the first book, Rowlings mostly adds details to the wizard universe, without adding anything really new. What is surprising is that racism rears its ugly head among the wizards. There's much talk about 'pure-blod' and 'mud-blod', it's not the core of the main plot, but it still surprised me (pleasantly). Potter, just barely, survives another summer with the Dursleys and finds himself back at Hogwarts. Everything is back to normal, except... something is attacking the kids and turning them into statues. I'll not say anything more about the plot, I'll just tell you that it's as much a page turner as the first one was. Written on 1st December 2001 by TC.